Is The Home Depot, Inc. (NYSE:HD) A Good Stock To Buy? Out of thousands of stocks that are currently traded on the market, it is difficult to identify those that will really generate strong returns. Hedge funds and institutional investors spend millions of dollars on analysts with MBAs and PhDs, who are industry experts and well connected to other industry and media insiders on top of that. Individual investors can piggyback the hedge funds employing these talents and can benefit from their vast resources and knowledge in that way. We analyze quarterly 13F filings of nearly 750 hedge funds and, by looking at the smart money sentiment that surrounds a stock, we can determine whether it has the potential to beat the market over the long-term. Therefore, let’s take a closer look at what smart money thinks about The Home Depot, Inc. (NYSE:HD). Is The Home Depot, Inc. (NYSE:HD) the right investment to pursue these days? The smart money is becoming hopeful. The number of bullish hedge fund positions inched up by 1 in recent months. Our calculations also showed that HD isn’t among the 30 most popular stocks among hedge funds. 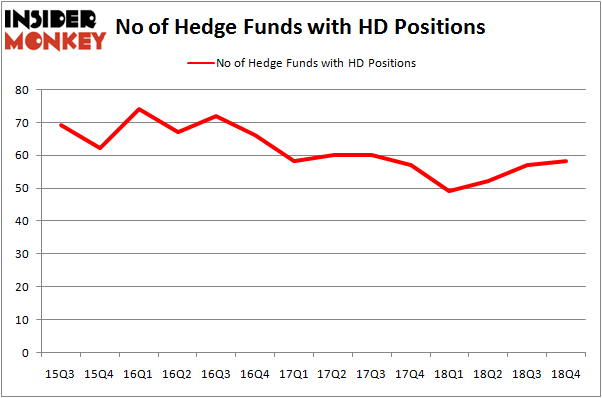 HD was in 58 hedge funds’ portfolios at the end of December. There were 57 hedge funds in our database with HD positions at the end of the previous quarter. We’re going to go over the recent hedge fund action encompassing The Home Depot, Inc. (NYSE:HD). Heading into the first quarter of 2019, a total of 58 of the hedge funds tracked by Insider Monkey were bullish on this stock, a change of 2% from the previous quarter. By comparison, 49 hedge funds held shares or bullish call options in HD a year ago. With hedge funds’ positions undergoing their usual ebb and flow, there exists a select group of key hedge fund managers who were adding to their stakes considerably (or already accumulated large positions). Of the funds tracked by Insider Monkey, Fisher Asset Management, managed by Ken Fisher, holds the largest position in The Home Depot, Inc. (NYSE:HD). Fisher Asset Management has a $787.4 million position in the stock, comprising 1.1% of its 13F portfolio. On Fisher Asset Management’s heels is Arrowstreet Capital, led by Peter Rathjens, Bruce Clarke and John Campbell, holding a $782.7 million position; the fund has 2.1% of its 13F portfolio invested in the stock. 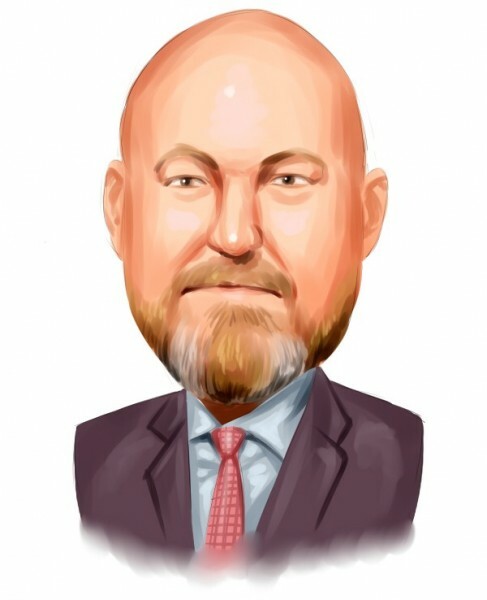 Other professional money managers that are bullish encompass John Overdeck and David Siegel’s Two Sigma Advisors, Cliff Asness’s AQR Capital Management and Jim Simons’s Renaissance Technologies. With a general bullishness amongst the heavyweights, some big names have jumped into The Home Depot, Inc. (NYSE:HD) headfirst. Senator Investment Group, managed by Doug Silverman and Alexander Klabin, initiated the largest position in The Home Depot, Inc. (NYSE:HD). Senator Investment Group had $85.9 million invested in the company at the end of the quarter. Michael Kharitonov and Jon David McAuliffe’s Voleon Capital also initiated a $47.3 million position during the quarter. The other funds with brand new HD positions are Frank Brosens’s Taconic Capital, James Parsons’s Junto Capital Management, and Robert Bishop’s Impala Asset Management. Let’s check out hedge fund activity in other stocks – not necessarily in the same industry as The Home Depot, Inc. (NYSE:HD) but similarly valued. These stocks are Taiwan Semiconductor Mfg. Co. Ltd. (NYSE:TSM), The Boeing Company (NYSE:BA), Toyota Motor Corporation (NYSE:TM), and HSBC Holdings plc (NYSE:HSBC). All of these stocks’ market caps match HD’s market cap. As you can see these stocks had an average of 30.75 hedge funds with bullish positions and the average amount invested in these stocks was $2301 million. That figure was $3965 million in HD’s case. The Boeing Company (NYSE:BA) is the most popular stock in this table. On the other hand Toyota Motor Corporation (NYSE:TM) is the least popular one with only 8 bullish hedge fund positions. The Home Depot, Inc. (NYSE:HD) is not the most popular stock in this group but hedge fund interest is still above average. This is a slightly positive signal but we’d rather spend our time researching stocks that hedge funds are piling on. Our calculations showed that top 15 most popular stocks among hedge funds returned 19.7% through March 15th and outperformed the S&P 500 ETF (SPY) by 6.6 percentage points. Unfortunately HD wasn’t in this group. Hedge funds that bet on HD were disappointed as the stock returned 6.8% and underperformed the market. If you are interested in investing in large cap stocks, you should check out the top 15 hedge fund stocks as 13 of these outperformed the market. Here is What Hedge Funds Think About Cisco Systems, Inc. (CSCO) Were Hedge Funds Right About Merck & Co., Inc. (MRK)? Should You Buy The Boeing Company (BA)? Were Hedge Funds Right About The Coca-Cola Company (KO)? Do Hedge Funds Love Taiwan Semiconductor Mfg. Co. Ltd. (TSM)? Were Hedge Funds Right About Novartis AG (NVS)?